Is your pup stressed out from being left at home alone all day? Maybe bored enough to eat the couch, your favorite shoes or the dining room table? Camp Bow Wow Delaware - North Day Camp, a premier dog day care service, is a dog gone fun way to give your pup exercise, mental stimulation and socialization with both dogs and people. Your pup will ‘dig’ our climate-controlled indoor play yards, and they can also get some fresh air and have fun in our large outdoor play yards. We’ll do everything we can to ensure your dog is happy and healthy at Camp and you can feel confident knowing your dog will be well-cared for while they play all day in our safe and secure environment. We also STRONGLY suggest the Canine Influenza Vaccine. Canine Influenza is serious and can make dogs very ill. Please ask your vet for this vaccine or get it for $30/dose at our monthly vaccination clinics. Be on a monthly flea and tick medication. Since flea/tick collars cannot be removed quickly in case of emergency, they are not allowed to be worn at Camp. If you use a flea/tick collar it will be kept with your dog's leash while the dog is at Camp. Come into camp wearing wear a Quick Release collar (pinch to open) and a name tag. We sell quick release collars and name tags at low prices for owner convenience. We offer Day Camping all days except for 7 major holidays. Major holidays are: New Year's Day, Easter, Memorial Day, July 4th, Labor Day, Thanksgiving and Christmas Day. Campers must come from the same household. Price is per camper. Campers must come from the same household. Price is per month. Extra Individual time for your Camper with a Counselor for snuggles. Extra Individual time for your Camper with a Counselor for one on one play. 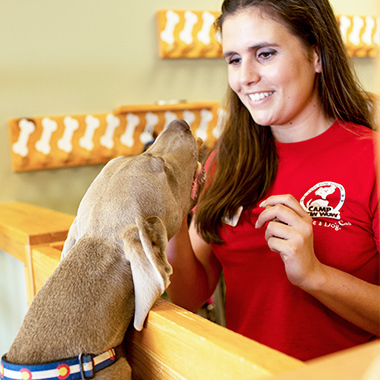 One of our Trainers will be happy to spend time working with your pup while at Camp. Owners are to specify what to focus on during the session. One of our Trainers will be happy to work with your pup on behaviors you'd like to see improved. Owners are to specify what to focus on during the sessions. These can carry over to future stays.